These earbuds are able to withstand plenty of sweat despite lacking an official IP rating. 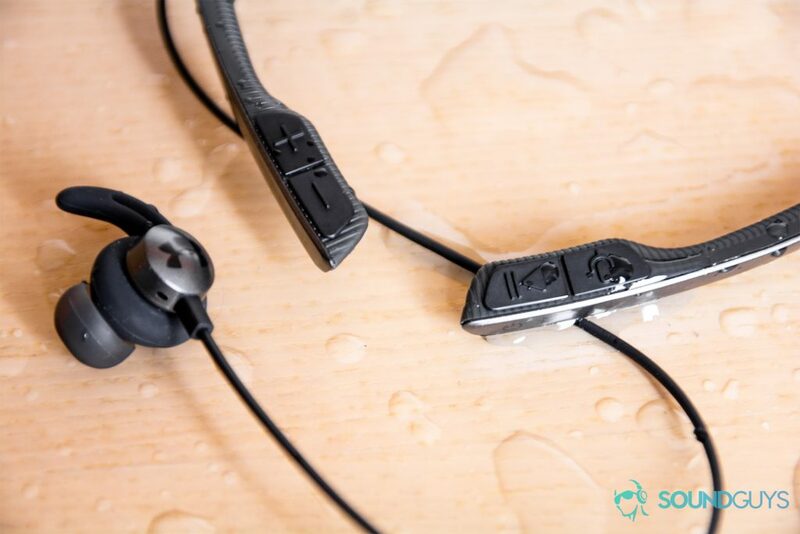 These earbuds are water-resistant, durable, and comfortable for various types of athletes. Since its release, the Under Armour Sport Flex Wireless by JBL have come down markedly in price, making them a bargain. Updated on September 21, 2018, to account for price changes. Working out is hard enough, but picking out a pair of earbuds shouldn’t be. Under Armour’s partnership with JBL attempts to ease the decision-making process. The Under Armour Sport Flex Wireless by JBL earbuds are lightweight, comfortable, and sweat-resistant. JBL and Under Armour even throw us a motivational bone with a free one-year premium Map My Run membership. Does this mean that we should we all reach for the Flex when flexing? TheUnder Armour Sport Flex Wireless by JBL includes wing tips which are strong yet pliable. The eye-catching, red box is easy to read and understand. Inside, Under Armour and JBL keep things simple. Hugged by condensed foam, the Flex earphones are proudly displayed. Directly below the pièce de résistance are alternate ear tips (S/L and ear hook-less enhancers), a micro-USB cable, and a free 12-month premium membership to Map My Run. 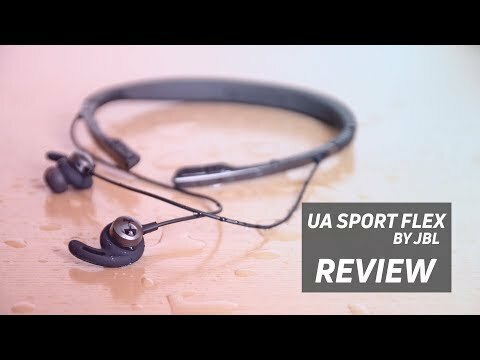 How is the Under Armour Sport Flex Wireless by JBL built? The Under Armour Sport Flex Wireless by JBL earbuds are magnetized and can stick together or to dumbbells. Surrounded by a magnetic housing—which enables the earbuds to be linked together, preventing loss—JBL’s 8.6mm dynamic drivers do an excellent job pumping out ridiculous sub-bass. Plastic and silicone constitute the Flex earphones’ build. The Flex Zones bend in and out to adjust to the user’s needs. Why someone would contort the neckband so obtusely that it resembles an ohm (Ω) sign is beyond me. But, the option remains. When running, the neckband bounces around like a child after his third scoop of ice cream. Though its dubious durability makes a meek first impression, the cables have held up well. They’ve buoyed from the depths of my backpack and withstood sharing a confined pocket space with various keys. The silicone ear tips are tough and feel more comfortable than our best workout earbuds, the Jaybird X3. The Under Armour Sport Flex Wireless by JBL Flex Zones are easy to adjust mid-run. While the neckband style may be off-putting for some, Under Armour and JBL did an excellent job designing the earphones. Its lightweight form factor is unobtrusive. Underlining the JBL logo is the RunSafe LED. The light is toggled via the multi-function button. Coincidentally, this also controls virtual assistants and allows users to answer and end calls. When running, the neckband bounces around like a child after his third scoop of ice cream. The bouncing is a nuisance and the subsequent vibrations degrade the sound quality. But this can be overlooked since you’ll be using these for exercising. Playback and volume controls are intuitive with the Under Armour Sport Flex Wireless by JBL earbuds, and accessing Google Now or Siri is responsive. The Flex operate on Bluetooth 4.1 and command response is snappy. Operating Google Now and skipping tracks is instantaneous. Additionally, initial pairing is quick. From then on out, the Flex is able to reconnect with ease. Videos have a two-second delay, suggestive of an SBC codec. Since these are workout-oriented, the lag can be forgiven. But sitcom fans will see the punchline before hearing it with the JBL and Under Armour’s Sport Wireless Flex earphones—just something to be aware of. Charging the Under Armour Sport Flex Wireless by JBL via micro-USB is a bit outdated but quick nonetheless. Speed Charge requires five minutes of charging for one hour of playback. An invaluable feature. The total duration is listed at 12 hours, requiring two hours of charging via micro-USB; not USB C, unfortunately. It would have been nice for JBL to include a way to manually check the battery. Users’ only indicator is the LED dot on the right side of the neckband. It flashes red, instead of blue, when the battery is low. Flex Zones are enveloped in silicone, unlike the rest of the plastic housing of the Under Armour Sport Flex Wireless by JBL. The overall sound signature can be illustrated by imagining the ripped guy who always skips leg day. Or, if you prefer, visualize the journalistic writing method, the inverted pyramid. Lows are ridiculously emphasized. Mids are decent. And highs, well, highs are neglected. Arcade Fire’s “Everything Now (Toda Ya)” remixed by Bomba Estéreo, receives the Flex VIP sub-bass treatment. Listeners will feel like subwoofers were implanted into their skulls. Worth noting, power does detract from detail. Lows may be striking but listen closely. They lack dimension. It sounds like the bass and sub-bass are fighting for the spotlight, rather than working in tandem. Listeners will feel like subwoofers were implanted into their skulls. The SafeRun LED is a useful feature, but you’ll likely have to visit the Under Armour Sport Flex Wireless by JBL manual to operate it. Mids experience a volume boost but lack full attention to vocal nuances. “Kiss With A Fist” performed by Florence + The Machine, runs amock. Florence Welch’s vocals and Tim McCall’s guitar riffs violently clash. Since the Flex are unable to approach midrange frequencies with delicacy, Welch and McCall’s parts mow each other down with brute force. The Cranberries’ “Linger” lacks crispness in the highs. They’re present but overwhelmed by more salient low frequencies. Normally, the highs here awaken the listener, perking up her ears. Washed away by the lows, the treble sounds vacuous. During the intro, it’s clear that the Irish band intended for highs to emit a glimmer, but even then, the JBL misses the mark. Though the Under Armour Sport Flex Wireless by JBL lack an official IP certification, the nano coating does a good job. Actually, these are an appropriate workout earphone for pretty much everyone including runners, if you can get past the bouncing neckband. If not, however, you may want to stick to the Bose SoundSport Wireless. The Flex neckband does, however, play nicely with a helmet. Plus, these are incredibly bass-heavy earbuds, which plays well to athletes of all sorts. UA Sport Wireless Flex headphones deliver secure fit for sports and all-day comfort. Flex zones adjust to find the perfect fit no matter the activity. UA Sport Wireless Flex headphones drive your workouts thanks to their big, powerful JBL Charged Sound. And Bluetooth® wireless enables easy, cord-free connection. UA Flex headphones are sweat resistant with advanced nano coating. Stay safe after dark with the new RunSafe™ LED. A long-lasting 11-hour plus battery features Speed Charge to deliver an hour of playback on just five minutes’ charge. Control music, volume, calls, mute and unmute the mic when you’re in a call, and even activate Siri® or Google Now™ with a long press.